Due to over-scheduling, the explosion of indoor electronic play, parental fears of unsupervised outdoor play, and a lack of neighborhood green spaces, “nature play” has become a rarity for today’s children. Studies have shown that exposure to nature can be a powerful form of therapy for many familiar maladies: depression, obesity, and attention deficit disorder. 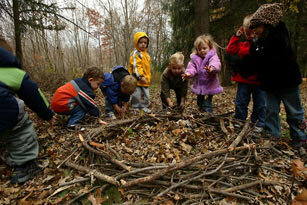 Exposure to nature has also been shown to reduce stress and increase attention spans. Nature-focused Preschools may be the best structured approach for simulating the bond-forming, unstructured childhood explorations of nature that were once so common but now seem so unattainable. According to an article in Environment and Behavior, Vol.34, No. 6 (2002) titled "Environmental Socialization: Quantitative Tests of the Childhood Play Hypothesis" (Bixler, Floyd and Hammitt), children who are exposed to natural environments early in life show later environmental preferences in the ’ life domains of work, leisure, and school’. According to the researchers, children who played in woods and other wild settings up to age four showed greater interest in pursuing careers outdoors or in the natural environment, as well as a greater interest in activities tied to outdoor recreation and education. 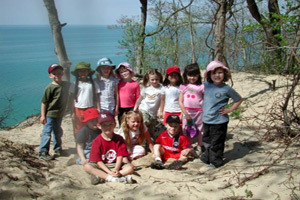 As a preschool dedicated to exploring the natural environment, the Field Station is able to promote long range environmental stewardship while reaching short term environmental and academic educational goals. Richard Louv, author of Last Child In the Woods: Saving Our Children from Nature-Deficit Disorder, “Kids who have direct access to nature are better learners.” Involvement in nature has also shown to reduce stress and increase attention spans. Louv credits the positive affects of nature to heightened sensory activity (hearing, seeing, smelling, and touching) that occurs when people get involved in the natural environment. As stress and attention deficit disorders continue to rise in this country, the Field Station’s approach to environmental education is a needed component in current educational reform.